The M5 is a long range day/night vision thermal /CCTV Visible surveillance camera with a heavy duty multi sensor imaging platform for hostile environments. It combines a high resolution thermal imager with ultra long range zoom CCTV camera for a truly complete 24/7/365 imaging system. The M5 Multi Sensor pan tilt zoom (PTZ) Thermal imaging system is versatile, easy to install and operate. 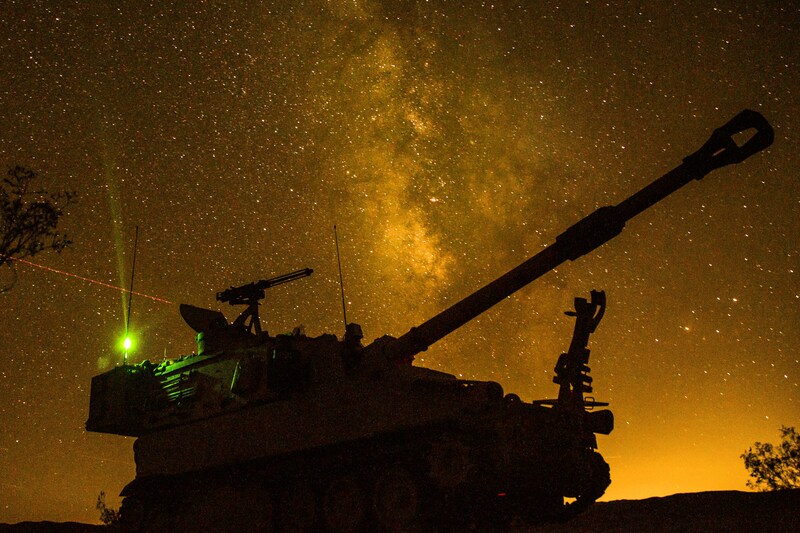 A Host of complimentary EOIR Optics can be added to the payload such as SWIR, BSTFA Color night vision, lasers, illuminators, GeoLocating and LRF (laser Rangefinders). This X-Long range thermal imager can withstand any weather, comes with wiper blades to take care of rain & handles any surveillance situation you can throw at it! Call us for Custom configuration options! Multiple new advanced HD High Definition Sensors can be integrated onto the M5 PT Pan Tilt FLIR thermal imager. The X27 Osprey COLORVISION ™ BSTFA Broad Spectrum Thin Film array imager is the latest add-on Sensor into the M5 Gimbal. The X27 is the worlds highest performing true color low light enhanced night vision sensor technology. The X27 is a Cutting edge broadband Visible/NIR/SWIR 1080P HD Sensor that can achieve outstanding Color Day like imagery in extreme low light levels, Below are sample videos of the systems Detection, Recognition, Targeting and Identification capabilities. The unit is catered for mobile, fixed, marine and mast mounted applications. 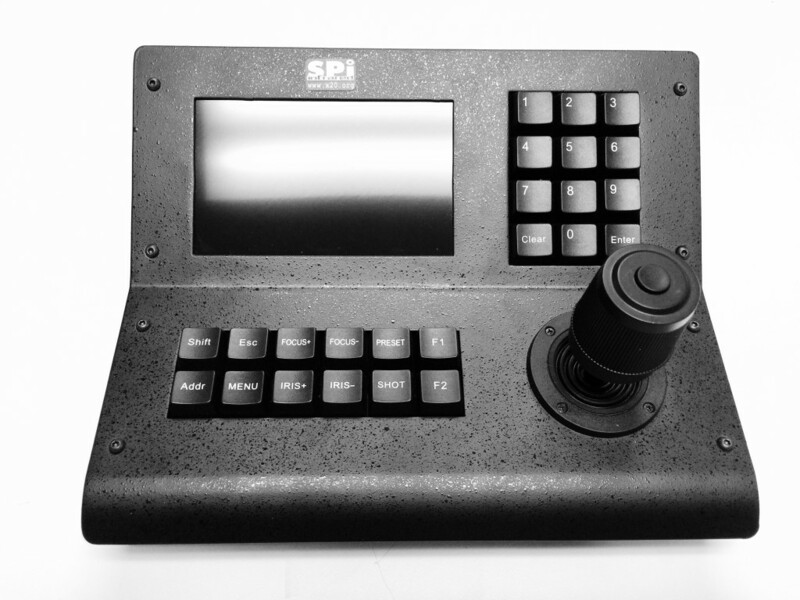 Contact SPI with you custom requirements, We can find you a solution rapidly, efficiently and affordably. The M5 thermal surveillance camera PTZ is a true multi sensor imaging platform. Featuring a high resolution thermal imager with digital zoom and color thermal imaging mated to a high quality CCTV visual imaging camera with ultra long range zoom and auto focus. The sensors are mounted on a variable speed pan tilt base with 360 degree continuous rotation. 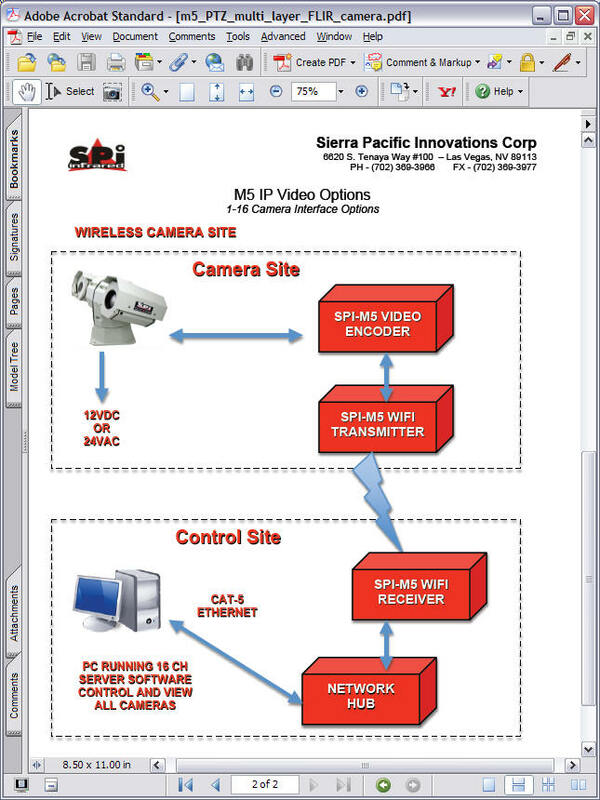 The system responds to standard PELCO-D commands and can be programmed to auto scan and perform remote tours. No other system can provide the durability, feature set and affordable price of the M5 Thermal PTZ systems. The M5 Has been installed in many key facilities and works exceptionally well mast mounted with standard or telescoping masts. 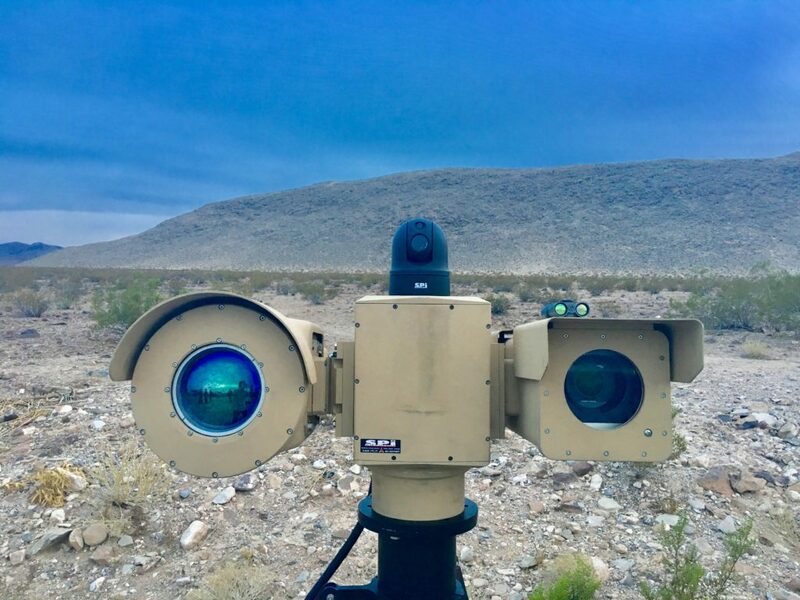 Border patrol Scope trucks have adapted the M5 thermal imaging nightvision system for immigration/frontier border patrol and homeland security. The enemy is real. The night is dark. The job is critical. Get the right tool to get it done! The future is here now and its more affordable than you think. In today’s uncertain times of world conflict, it has become more important than ever for the good guys to own the night. 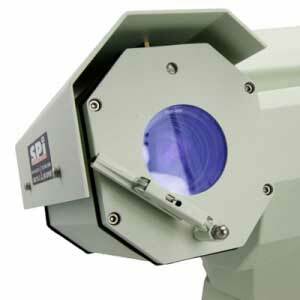 Traditional pan tilt zoom thermal imaging platforms have long suffered from two majors drawbacks, price and size. For years these multi sensor pan tilt imaging systems have been mammoth contraptions sometimes standing over two feet tall and weighing in at 100 pounds plus. The support gear required to safely mount and position these units made them extremely unpractical for all but the most extreme of applications. In addition, these giants had price tags that could range from a minimum of $35,000 to as high as $750,000 further limiting there use to exotic applications. unfortunately, this set of circumstances meant that a great many agencies that truly need this capability had no hope of ever procuring this expensive and cumbersome technology. The M5 thermal pan tilt zoom system represents a breakthrough in innovative design philosophy that now makes thermal pan tilt zoom systems smaller, lighter and much less expensive. By utilizing COTS components and leveraging existing technologies the M5 can deliver comparable performance at a small fraction of the cost and size of traditional pan tilt systems. A wide range of options and industry standard control protocols further extend the M5’s capabilities. The choice is clear for any professional involved in night time operations- the M5 thermal surveillance camera is your tool of choice. NEW OPTION– Ultra Low Light Day/Night HD X26 HFIS imager optimized to 1100 NM for VIS/NIR SeeSpot 1064 (Link for the X26 Hyper Fidelity Intensified Sensor HFIS) / The X26 HFIS Camera is the Ultimate Day/Night HD imaging camera that offers unmatched performance in full daytime and very dark night time applications. The HFIS has Generation 3 Image Intensified image quality and sensitivity, without having the inherent problems of traditional image intensified systems, full sunlight and high energy scenes do not disturb the X26, with its super wide dynamic Range and ultra sensitive 1100 Nm detection capabilities. The M5 is a very robust heavy duty all weather system that is suited for vehicle mobile applications, emergency response vehicle / tactical vehicle mounted installs as well as mast, pole, marine, border, security, surveillance, building and fixed applications. The system is fully universal with standard rs485 data controls, analog, digital, ip, ethernet, poe, GIG-E (gig ethernet) and standard outputs for ease of integration into any existing installs and new setups. Ideal for border, mobile, fixed, coastline and perimeter security applications, the M5 can be custom built with your choice of exotic digital sensors catered to meet any mission. The low cost affordable M5 / M7 Family of thermal Infrared imaging FLIR PTZ GPS compass camera system are a Daytime EO Television long range telephoto and thermal Infrared FLIR imager Sensor combo platform. All weather housing and robust military grade sensors ensure long life and quality imaging performance, The systems are available in Short, medium, long and Ultra Extreme telephoto long range lens optical options. Precision Pan and tilt mechanism with programmable tours ensure rock steady movement with zero backlash. The systems can be Fixed mounted, mobile and marine installed in many custom applications. Email us with your needs, we will mfg the systems ready to plug and play into your infrastructure. 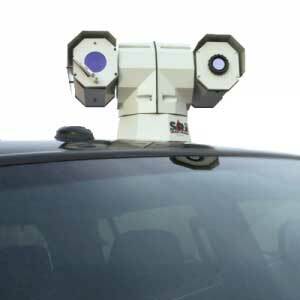 The Systems can be integrated with LWIR uncooled Thermal IR detectors or MWIR cooled Thermal IR Engines. 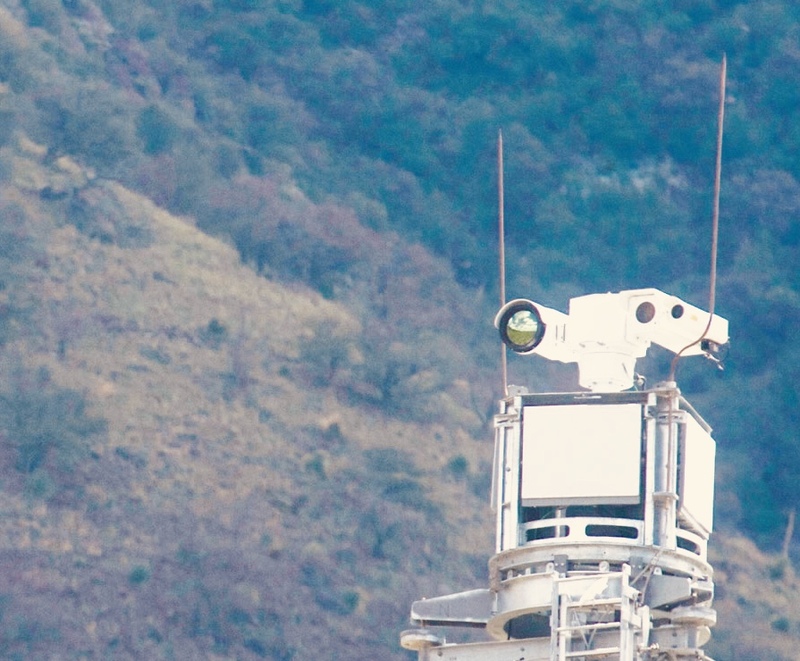 The M5 thermal pan tilt zoom imaging platform is equally at home on fixed mount structures, vehicle operations and Marine vessel applications. Whatever you need the M5 delivers. There are many PTZ Pan Tilt Zoom Imaging payloads available in the marketplace, The M5 FLIR Thermal Imaging Security/Surveillance camera stands out due to its affordable cost, robust imaging performance and high duty cycle. The M5 can be used on masts, mobile vehicles, marine boats, on buildings/facilities, and just about anywhere. The M5 LWIR camera has independent sensor channels which allows the user to select from different sensors with zero lag time and instant real time live imaging. Being fully universal, the M5 can be easily integrated into new networks or existing ones, standard protocols and output allow the user/installer to easily hook the M5 up without the need for any proprietary cables, connectors and data streams. Zero backlash pan tilt positioner make it rock steady when panning and tilting. Full camera and sensors controls are available for the user to get into the menu and alter the sensors performance based on the application. The M5 multi-sensor thermal surveillance camera system boasts the latest in uncooled microbolometer thermal sensors boasting a minimum thermal imaging sensor resolution of 76,800 pixels. This is four times the resolution of competing “low cost” thermal PTZ systems that have a bare minimum 160×120 pixel sensors. 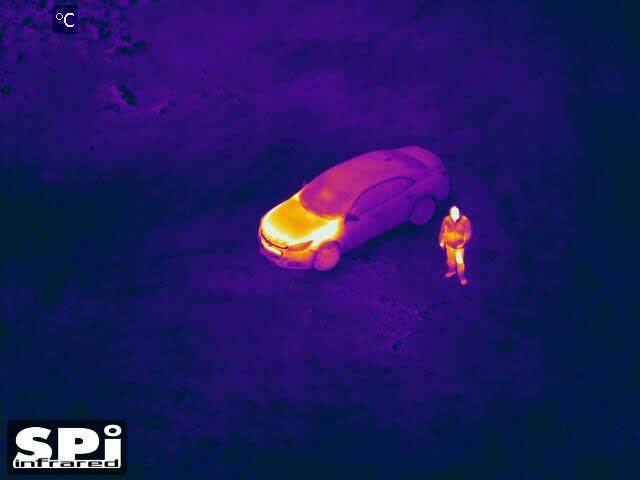 For the most demanding of situations the M5 can also be equipped with the latest in High Definition thermal sensors featuring an astounding 307,200 pixel thermal sensor resolution. The M5 has all the bells and whistles included as standard features. The CCTV camera can become obscured by rain, mud, snow or dirt and the integrated windshield wiper can be remotely activated on the M5 menu system to quickly and efficiently clean the lens. No matter what the conditions bring, the M5 strives to deliver. Threats and targets of interest come in all sizes and from every direction. They also move! Situational awareness requires that you have the ability to not only see these targets but track them wherever they go. Many high priced systems can only spin a maximum of 360 or even 380 degrees in rotation and then they have to spin all the way around the other direction to keep tracking a target. The M5 utilizes an advanced slip ring technology to give the M5 the advantage of being able to spin continuously in either direction. With the M5 you never have to take your eyes off the target due to technical limitations of your imaging system. The M5 has your back, and your front, and any other direction you want to point! The M5 is loaded right out of the box with the thermal infrared imaging features that you need for a successful mission outcome. The M5 thermal pan tilt system does not overload the user with useless features and toys. Advanced thermal imaging features include the following. Auto image exposure so that the operator is not wasting time and attention on image adjustments. Thermal digital zoom helps the M5 to bring distant targets in for a closer look. 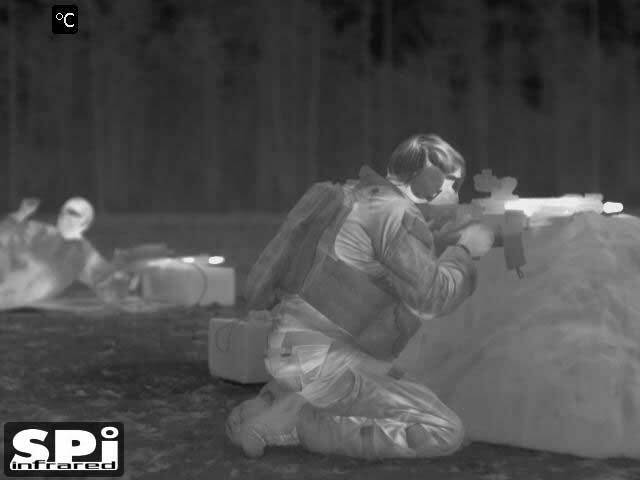 The included full color thermal imaging helps the user discriminate targets in the scene. High resolution and high quality germanium optics further enhance the clarity and precision of the M5 Thermal Camera system. The M5 sensors are integrated into an intelligent pan tilt positioning platform that can be user configured to satisfy any criteria. With the M5 you can set up to 128 preset points and tell the M5 to scan between two points setting both speed and direction. You can also set up to 6 scanning paths with each path containing up to 16 pre-set points. With these options you can easily setup the M5 to automatically scan your target area while you watch for intruders. For example you could set the M5 to Pan/Tilt to the entrance gate, zoom in and hold for 5 seconds. Next the M5 would automatically Pan/Tilt to the perimeter fence, zoom out and hold for 8 seconds. Then on to the next point all automatically. To stop the scan all you have to do is grab the joystick for instant user control over ride. Simple, intelligent and powerful. 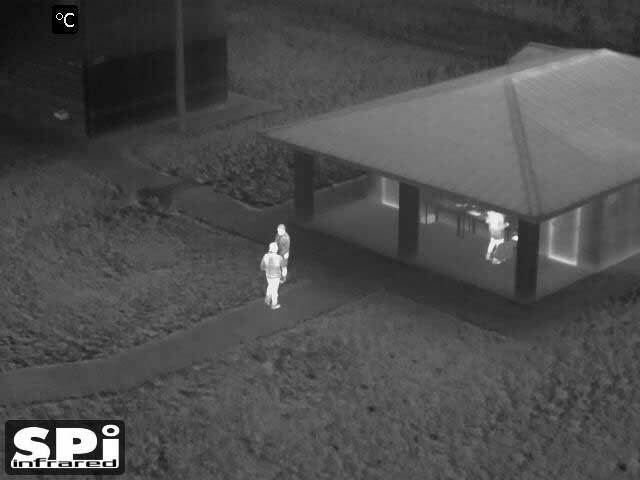 The M5 thermal surveillance camera is a potent imaging system either day or night. All M5 multi sensor thermal pan tilt zoom systems come with an ultra crisp CCTV video component. The CCTV camera sub system boasts an incredible 36X optical and 12X digital zoom for a total video zoom of 432X! Long range imaging is no problem in day light or low light conditions. 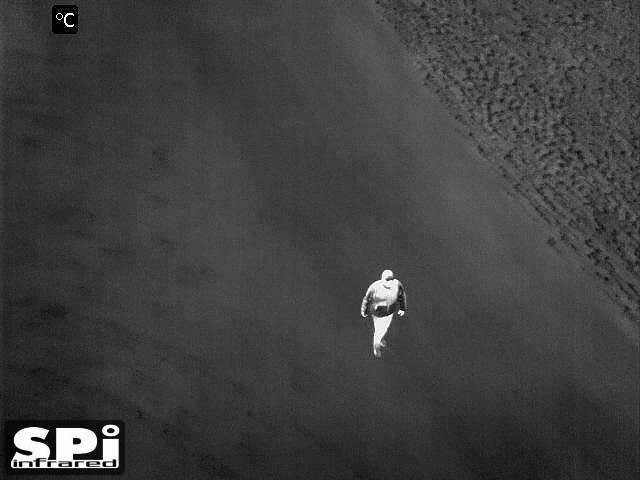 Thermal zoom and telephoto imaging can be customized for your application. 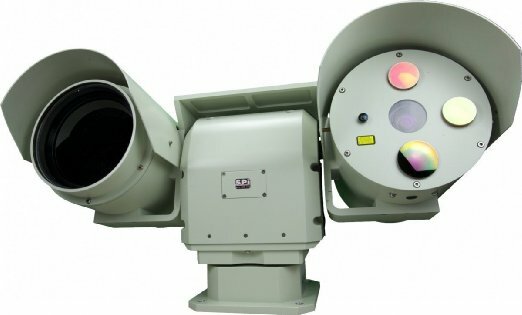 The M5 thermal sensor can be coupled to a variety of precision engineered long range germanium optics and digital zoom configurations. The M5 multi sensor thermal pan tilt system was designed and manufactured to be easily integrated into a wide variety of platforms. The base of the lightweight M5 system is secured with a simple 4 bolt mounting pattern. Integrated bushings protect the M5 from shock and vibration. Wiring of the M5 is as simple as possible. All that is required is a power connection, serial connection (for control) and simple video connection. The M5 can easily be installed in guard towers, network video systems, wireless configurations, buildings, vehicles, vessels and almost any other location that you can think of. 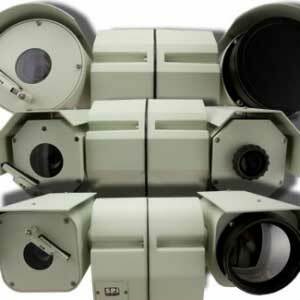 COTS fixed and zoom PTZ Thermal imaging lenses include 9mm, 19mm, 25mm, 35mm, 45mm, 50mm, 55mm, 60mm, 75mm, 85mm, 100mm, 25-75mm, 25-100mm, 25-125mm, 25-150mm, 25-175mm, 25-200mm, 25-225mm, 25-250mm, 25-275mm, for longer ranges refer to M7, M9 and M11 Long Range thermal Pan tilt Zoom thermal imaging flir cameras. Look up the SPI M7 for detection PTZ EOIR Ranges up to and exceeding 10 kilometers ! 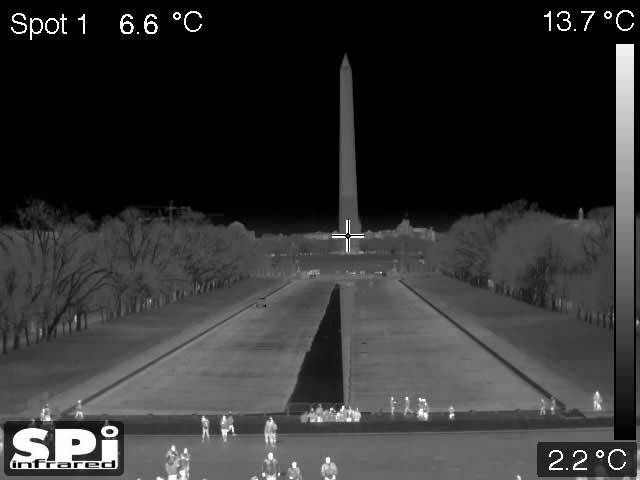 A new tool for seeing in total darkness, and in extreme weather conditions, is thermal imaging. 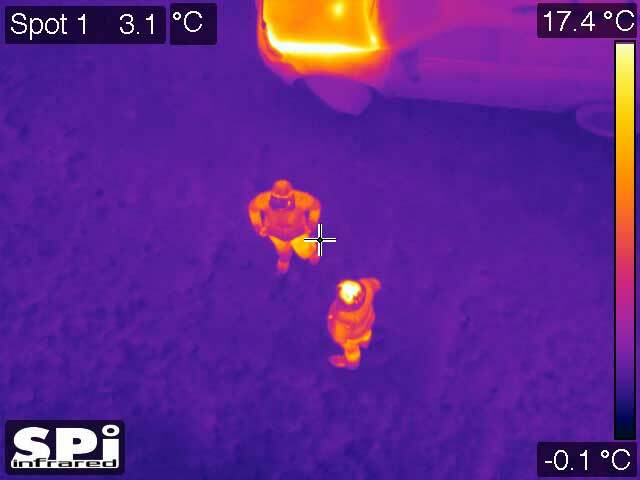 Thermal imaging is the use of a thermal imaging camera to “see” thermal energy emitted from an object. 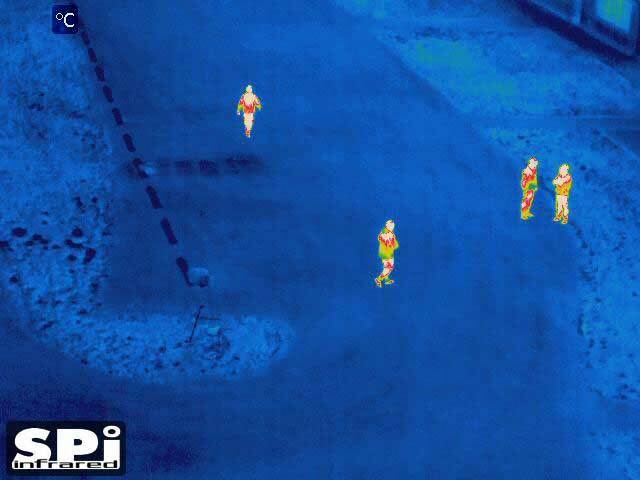 Thermal imaging cameras produce images of invisible infrared or “heat” radiation. 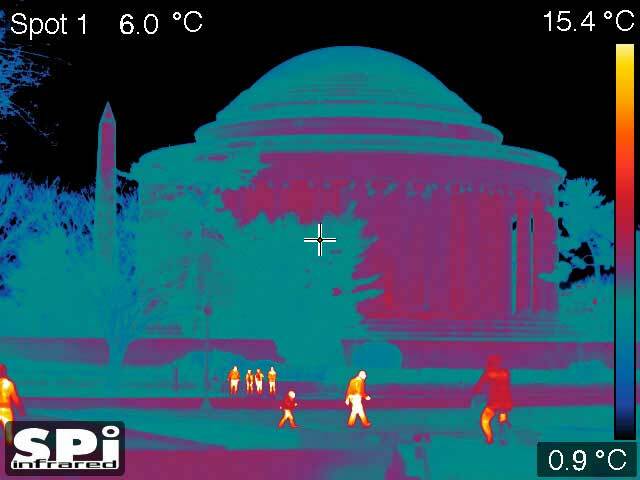 Based on temperature differences between objects, thermal imaging produces a crisp image on which the smallest of details can be seen. They work both during daytime and nighttime. Most FLIR IR infrared Systems thermal imaging cameras contain an uncooled Vanadium Oxide detector. Not only does this produce excellent quality thermal images, since it is not containing any moving parts, it needs virtually no maintenance. 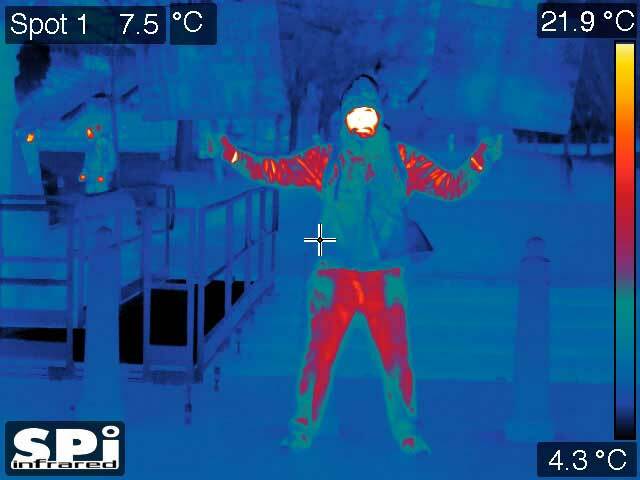 Thermal imaging technology requires no additional lighting or illumination and has no regular maintenance costs. 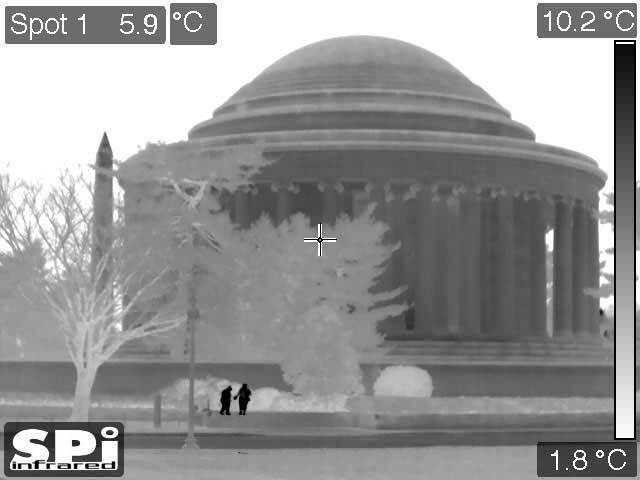 Because everything generates heat, thermal imaging cameras can see as well at night as they can during the day. Cameras dependent on visible light are useless at night or in poor visibility without supplementary illumination from lamps, LEDs or lasers. 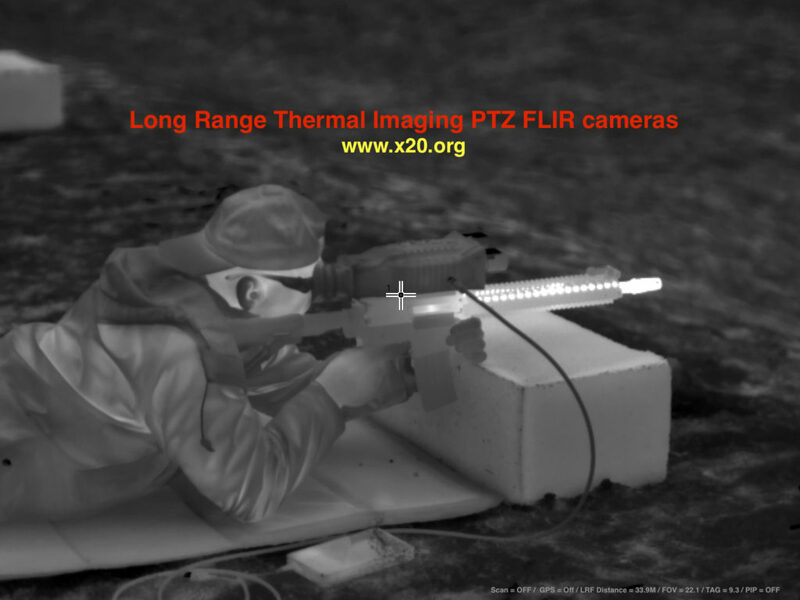 SPI’s long range IR FLIR PTZ pan tilt thermal imaging cameras will not only protect borders and assets against intruders during the darkest of nights. The cameras are also perfectly suited for daytime surveillance. 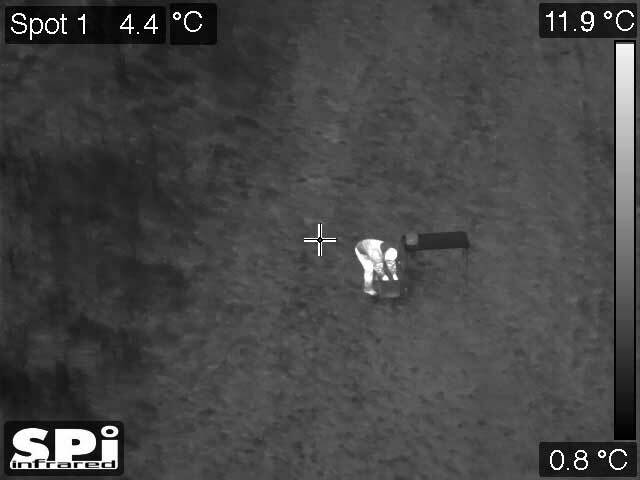 The long range infrared cooled and uncooled FLIR thermal imaging cameras will detect objects that remain invisible to the naked eye. For example, people hiding in the shadows or in the bushes will be detected. The cameras are also not blinded by glare from the sun. Force Protection, Border Security and Surveillance The Ultra extreme NFOV long range FLIR thermal imaging night vision PTZ surveillance systems cover more territory and enable detection and classification better than any other sensor suite available. Networkable video and control make the long range FLIR thermal imaging systems the perfect border security imaging solution. The systems can be connected to a radar in a so called “slew to cue” configuration. If the radar detects an object, the camera turns in the correct direction so that you get a visual image from that blip on your radar screen. Coastal Surveillance Some countries are bordered by thousands of kilometers of coastline. The long range ptz pan tilt zoom FLIR thermal imaging systems are the perfect tools to monitor what is happening along the coastline. They can be used to intercept illegal immigrants or to detect other threats coming from the sea. They are perfect for Vessel Traffic Monitoring and can work together with Automatic Identification Systems (AIS) and radars. Quick and accurate Pan & Tilt unit The ultra compact, ultra precision IP68+ Pan & Tilt unit is designed for heavy duty service in extremely demanding environments, from hot desert to arctic conditions. This positioning unit includes slip-ring connections for the different signals (video, power and data), which allow for infinite horizontal rotation, and provide DC servo drives for the rotary movement in both axes. High precision gears provide fast accurate movement, free from backlash and extremely low hysteresis, through a continuous 360° rotation. The performance contributes to find targets faster, as well as to get a good and stable display of the sensors’ pictures even in very narrow fields of view. Incremental encoders allow for accurate geo-referencing of targets with precise read-out of the vertical and horizontal angles. Our PTZ pan tilt gimbals are the longest lasting most reliable positioning gimbals available. Enhanced electronic and active gyro stabilization ensures jitter free imagery at extreme long ranges and while operating the system on the move on mobile/windy harsh mast/pole/tripod hydraulic and retractable platforms. 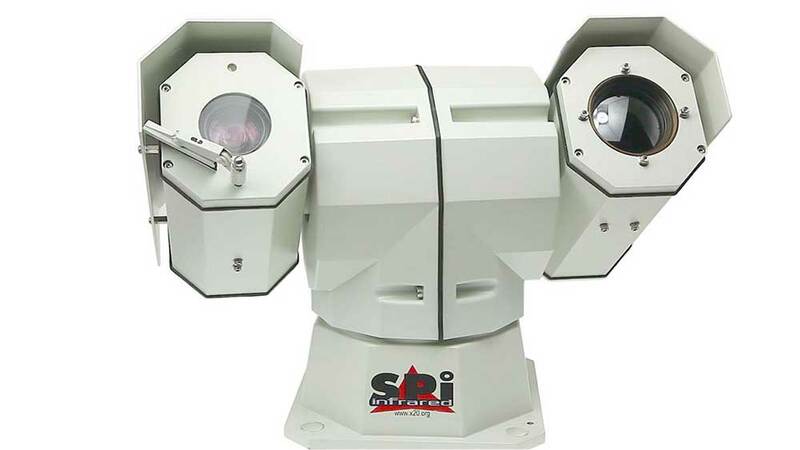 Laser Range Finder LRF, SPI’s ultra extreme long range day/night vision MWIR midwave cooled and long-wave LWIR uncooled systems can be equipped with long range eye safe Laser Range Finder. Combined with the GPS system and the electromagnetic compass, it will allow you to exactly determine where a suspected object is located and how far it is away even at extreme standoff long ranges. Easy to install learn and operate, Our long range thermal IR infrared imaging PTZ pan tilt gimbal systems are designed to be easily installed and operated from remote or local C2.